The biggest venture capital firms have invested in some of today’s most talked-about start-ups, and now we are seeing tech entrepreneurs making huge headways into the wildly exciting and growing financial technology arena. Fintech companies, as they’ve come to be known as, are leveraging on the power of software to promote financial planning and other portfolio management tasks. These start-ups are a special breed, founded with a goal of disrupting less technologically savvy corporations, and they are getting noticed. This year’s Appsters awards, taking place at Appsworld in London, have always been a showcase of leading-edge products within the start-up sphere, but it is easily overlooked that they are also recognising startups with the best financial technology mobile apps. The best Fintech app award to be presented at the Appsters speaks volumes in terms of outstanding innovation as well as contribution to technology within the financial sector. Certainly, consumers have been benefiting greatly – they have been worrying a lot less about their investments as Fintech startups encouraged them to embrace the digital revolution and to circumvent the disadvantages of limited resources and time, while getting their financial management needs met with polished and extremely mobile applications. What this means is this: no more losing trust in banks or losing grasp of your investments, because Fintech startups and apps are here to move a giant industry forward globally. A social media platform designed to be a bridge of communication between investors, traders and entrepreneurs, StockTwits is a new phenomenon that has taken the industry by storm. Patterned after Twitter, it took the concept of social networks and ingeniously created a great communication tool for connecting with other active investors. Such is a path less trodden, but it turns out that information has become one of the most valuable commodities in the investment markets. Often times you would require some fore-knowledge before making a crucial trade, and StockTwits does that with polish few portfolio management apps can boast. StockTwits is worthy of mention because of its huge adoption: 230,000 active members. Fintech startups have learned to harness the most effective business models to meet extraordinary large audiences. Ever dreamt of putting together all the financial portfolios of your entire family and getting the best financial advice with the information you provide? Future Advisor is the digital investment manager to meet that need. It is one of the smartest portfolio management apps, because it even adjusts for investors’ age and appetite for risk. It is truly Fintech at its finest: modern portfolio theory is factored into the app’s algorithms, including the Black-Litterman model, which measures asset allocation in proportion to the market value of that asset. Daniel Chia, a former vice president at Ortus Capital Management, and Cynthia Siantar, former equity capital market associate with HSBC, came up with an ingenious idea about creating a mobile app even New York hedge fund managers would use. The result is Call Levels, real-time investment portfolio management and notification service on the cloud, with monitoring for over 10,000 financial assets, including Stocks, Forex, Futures and even the elusive Bitcoin. The whole concept revolves around users setting a call level – a term common in investment circles to describe “call me” notifications whenever a price hits a certain level. With the Call Levels mobile app, you get an equivalent mobile notification, which really is the core of the service. It could even be described as its “heart”. The pain of many investors is dealing tediously with financial markets, and much time required for that. 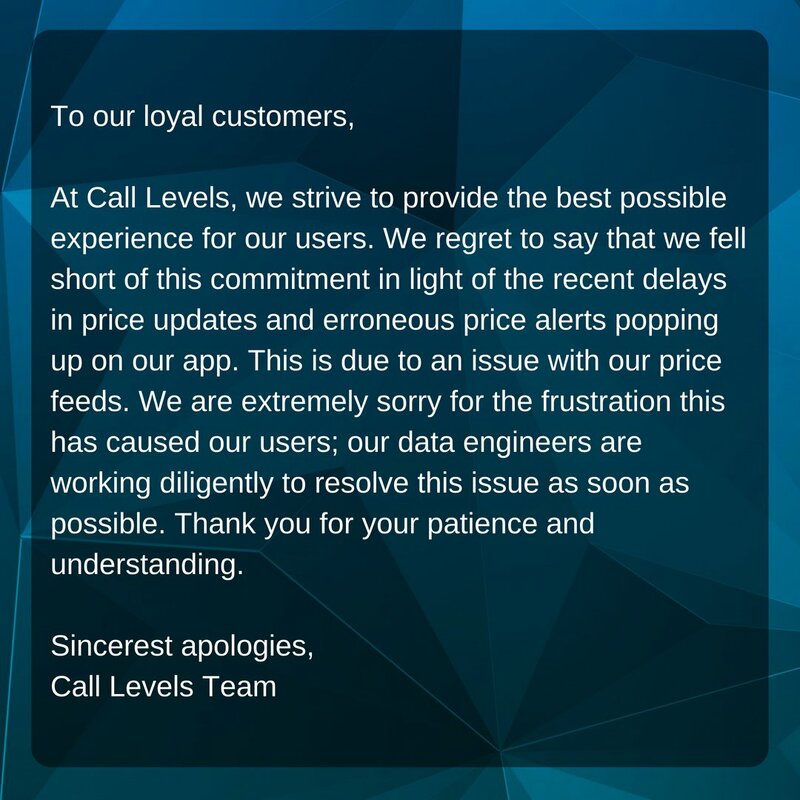 Call Levels promises to value other important pursuits instead, by serving up free, reliable and real-time price alerts to the most accurate “snap-shots” of any chosen market. With strong traction and usage so far, one could see why that Call Levels got nominated for best Fintech app at Appsters awards 2015. So, as any avid startup analyst could see, Fintech apps have been known as aggressive and extremely helpful resources for the investors of today. In an age where investing is profitable and popular like never before, Fintech startups are making huge ground, attacking a long-running market that has been traditionally dominated by the big financial institutions. With apps like Call Levels that aims to level the playing field between retail and institutional investors, we can look forward to more disruptions in the market that will entirely revolutionalize the way finance has been played out for the past decades. The change isn’t just coming; it has arrived. Download Call Levels, available for free for iOS and Android, or visit www.call-levels.com for more information.